I love a plant with a descriptive and evocative name. Cardboard palm plant (Zamia furfuracea) is one of those ancient plants with a lot of character that can grow inside or outside depending upon your gardening zone. What is a Zamia cardboard palm? In fact, it isn’t a palm at all but a cycad — like the sago palm plant. Knowing how to grow Zamia palms starts with knowing your USDA planting zone. This little guy is not winter hardy in the majority of North American regions, but it makes an excellent container or houseplant anywhere. Grow it outdoors in USDA zones 9 to 11 year round. What is a Zamia Cardboard Palm? We already ascertained that the plant is not a palm. Cycads, which have been around since the dinosaurs, form cones at the center of the plant. The cardboard palm plant is native to Mexico and has tropical tendencies in its preferred temperature and light levels. Zamia cardboard palm does have pinnate leaves like a palm tree, but they are rounded with a thick tuberous stem. The evergreen leaflets grow in opposing pairs of up to 12 per stem. It is a low growing plant that may spread 3 to 4 feet and an underground trunk. 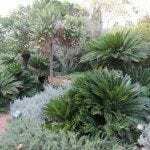 The trunk stores moisture in times of drought, which makes Zamia ideal for xeriscape gardens. Cardboard palm care requires enough moisture to keep the trunk fat and healthy. Never let it dry to the point that the trunk and stem are wrinkled or dry. Females may produce numerous bright red seeds when they are pollinated. They should be germinated in moist sand in flats indoors. Temperature range for germination is at least 65 F. (18 C.), but growing cardboard palms from seed is finicky business. Seeds should be sown immediately, as they are not viable for long. Once the seedling has emerged, it will look nothing like your adult plant. Young cardboard palm care includes moderate light until the second set of true leaves appears. Keep the sand moderately moist and transplant when the root base is robust. Maintenance is minimal when growing cardboard palms. Zamia thrives in moderate to bright light. It has a slow growth habit and does well in good potting soil as long as the container has excellent drainage. The plant is prone to some pests, such as spider mites, but its biggest problem is rot. Water deeply weekly in summer but reduce moisture in winter and fall by half. The thick underground trunk needs to be filled with stored water but over anxious growers may tend to overwater it and cause stem or crown rot. Once the crown is overtaken by fungal spores, it is nearly impossible to save. Prune off dead leaves as they occur and fertilize with a slow release palm food or a diluted household plant food once monthly during the growing season. Read more articles about Cardboard Palm Plants.